This post is about how the British helped Bahrain’s ruling Al Khalifa family take over a quarter of Bahrain’s wealth over the past 80 years. In particular, it focuses on the years between 1925-70. It also addresses some other interesting questions, such as the mystery of Abu Safah, and why the revenue allocated to the Ruling Family disappeared off the accounting books on two separate occasions. So before you wave a banner proclaiming support for the country’s wise and educated leadership, bear in mind that between the years of 1926 and 1970, Bahrain’s ruling family received about a quarter* of the nation’s wealth. 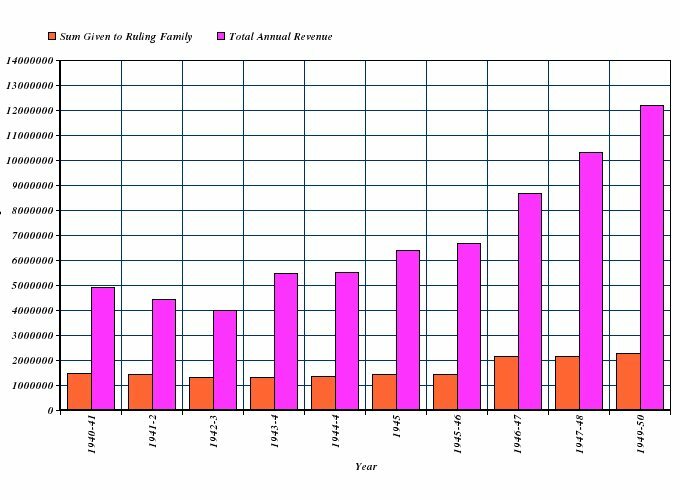 In fact, the amount given to the ruling family per year was always the largest item of recurrent expenditure. Until 1941, the amount given to the Ruler and those on the Civil List was consistently greater than the the sum of all other expenditures. In other words, one family got more per year than the health sector, education sector, public protection dept etc combined. Although the amount they receive now is almost certainly less, it is no longer recorded on the budget sheets, so it is not subject to scrutiny. Such a lack of transparency is, as we shall see, nothing new. Read on for an anger-inducing, yet interesting tale of greed and avarice. How is money given to the ruling family? ‘bare pittance for subsistence’, and those those who committed mischief would be ‘cut off absolutely and punished accordingly’. ‘held the purse strings and could cut off an allowance when he pleased’. The amount of money received directly by the Ruler was dependent on how good the deal was between the Bahrain government and the Bahrain Petroleum Company (BAPCO). The better the revenue sharing between the company and the government, the better it was for the both the people and the ruling family. It is also worth noting that Charles Belgrave (Political Adviser to the Sheikh) imposed a limit of 500,000 rupees on the Civil List back in 1930, though this became meaningless when the ruling family started receiving oil royalties. In 1952 a new 50-50 oil deal was struck, and the government was to receive ’50 percent of the profits of Bahraini oil and duty on oil imported from Saudi Arabia through the pipeline.’ (Annual Report, 1956, pg 106). This increase stemmed from the fact neighboring countries such as Qatar were getting similar 50-50 deals. However, due to the fact that Bahrain’s oil reserves were relatively limited, a new deal was struck in 1955. This guaranteed that the state (and the Ruler) would continue to get significant revenue from oil even when Bahrain’s own reserves were depleted . In this new agreement, the government would receive 50 percent of the profits of any oil refined in Bahrain. In all cases, the ruler would personally receive 1/3rd of all the oil revenue accrued to the government. It is hard to determine to what extent the Ruler’s desire for more income motivated his decision to push for a better deal, though Shiekh Salman bin Hamad Al Khalifa (Bahrain’s ruler from 1942 – 1961) was keen to double production in 1952. The fact the Ruling Family were receiving a third of oil royalties meant they had a vested interest in extracting as much oil as possible, even though this was bad for the wells. The Amir shall have an annual privy purse to be determined by a special Amiri decree. The privy purse may not be revised throughout the reign of the Amir, and shall thereafter be fixed by the law. Ebrahim Sharif also noted that the amount allocated for the Civil List in 2001 was 8.5 million dinars, which represented an increase of 2.5 million from 6 million . This increased in 2002 to 9 million. On 2003, the amount allocated to those on the Civil List was no longer included on the annual financial report, which meant that Bahrain’s elected MP’s, whose responsibility it is to scrutinize the budget, can no longer scrutinize the amount of money given to royals. Although al-Kuwari says this practice occurred after 1959, there is a budget for 1962 that does mention the allocation to the privy purse. However, instead of listing one third of oil revenue to privy purse under ‘expenditure’, it simply states Oil Receipts: Less on third to the Privy Purse under ‘revenue’. The inconsistencies in recording the accounts between 1959 and 1962 can be seen in the following accounts. Put simply, betwen 1962 and 1970, the government accounts do not list the amount of oil royalties going to the Ruler. The figure given for ‘Oil Receipts’ under ‘Revenue’ is actually two thirds of the total amount payable by oil companies to the State. There is little question about whether royalty payments stopped in 1962. According to a telegram sent from Shaikh Salman to the Chief Local Rep of BAPCO the royalty agreement was set to last until at least 1969, when it would presumably be subject to renewal. Educational and health services accounted for the largest single items of recurrent expenditure during the financial year and together they amounted to almost half the total expenditure incurred. 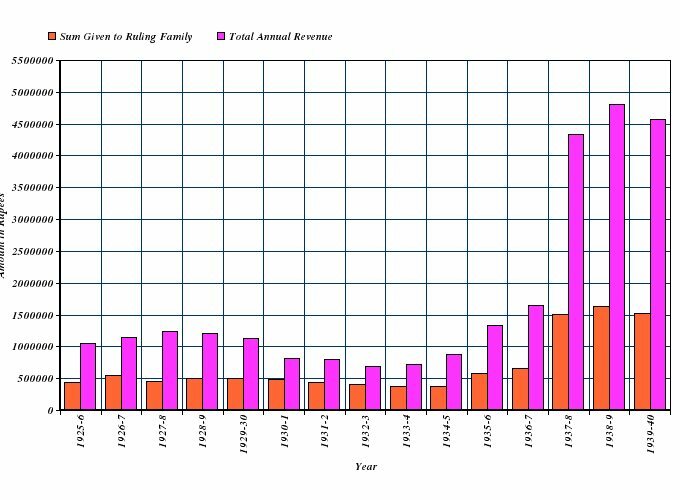 In actual fact, the largest single item of recurrent expenditure that year was the amount given to the Ruling family. 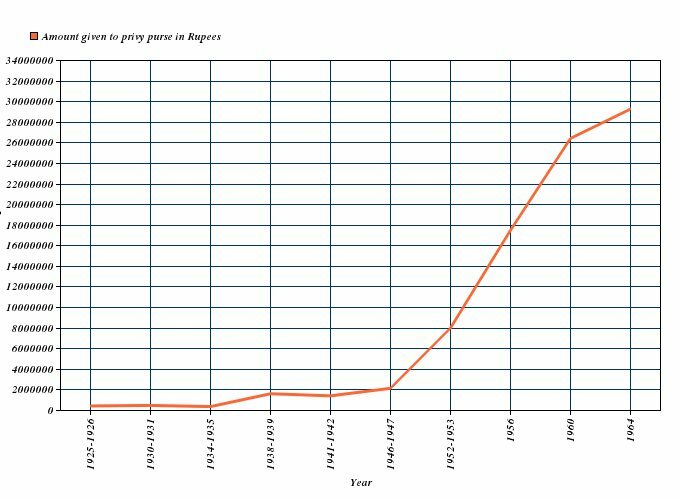 To put it in perspective, the payment to the privy purse in 1968 was BD 4,035,287. The amount allocated to education was BD 2,934,521. 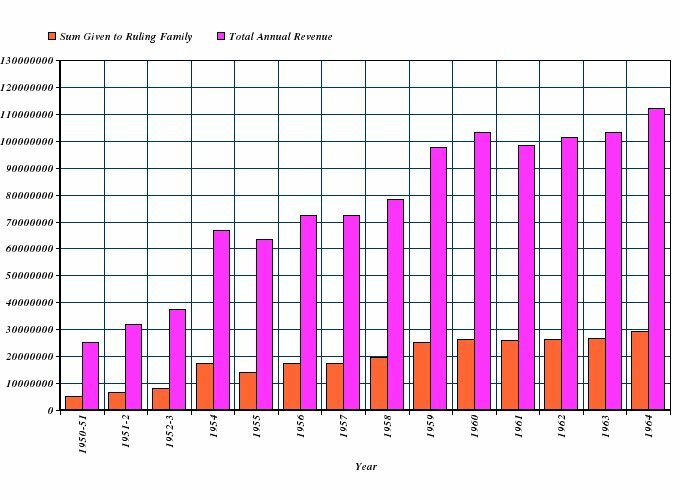 The ruling family therefore received almost twice the second highest item of recurrent expenditure. Check out the financial statement below. 20 years later, the acting Political Agent of Bahrain J.E.R. Little echoed, somewhat dryly, Belgrave’s sentiments. In 1955 it is expected that payments to the Privy Purse will amount to Rs. 13,400,00 or roughly 1 million sterling. Inevitably the payment of such sums to the Ruling Family will continue to be the subject of criticism locally, and it is no doubt due to his awareness of this fact that the ruler has donated a quarter of a million rupees to education, health and public protection. Other members of Al Khalifa apparently are impervious to the promptings of conscience. Given the disturbances of 1956, it was perhaps prudent of the Ruler to donate some of his ‘personal’ wealth to public protection. It is also ironic that the Ruler is ‘donating’ the nation’s wealth back to the country. 1) Since the government of Bahrain’s budgets, especially thsoe of 1966-1970, met their deficits by drawing from the reserve fund, it is difficult to beleive that all the revenue coming from the Abu Safah field was allocated to the reserve. 2) During the period 1960-1970, although the government of Bahrain’s annual reports (statement of revenue and expenditure) gave all the information affecting the reserve fund account (for example the setting up of a special account in 1960, the loss resulting from the sterling devaluation in 1967, and all withdrawals fromt his acocunt to meet the budget deficits), nothign at all is mentioned about the BAhrains tate’s half share of the Abu Safah Oil revenue. 3) All attempt sot get an explanation of this matter from officials in Bahrain have failed, in spite of their valuable help in providing other information. Since 1966, the government of Bahrain Annual Reports and all the official publications, as far as i known, seem to ignore the Abu Safah field before 1974. 4) All oil revenues received by the state and not appearing in the budget were allocated to the privy purse of the ruler. Therefore, on the basis of this assumption, the state oil revenue and the actual budgets, allows a reassessment of Bahrain’s public revenue and expenditure in a form which will enable an examination of the allocation of the Bahrain state oil revenue. If al-Kuwari is correct, then this represents a significant scandal in Bahrain’s history. It would certainly not be an implausible occurrence. Given that no officials were able to give satisfactory explanations, it seems unlikely that the 1972 agreement was a retroactive one, and that moneys received in 1974 (the year revenues from Abu Safah first appeared in the state budget) included profits that had accrued between and 1966 and 1972. If anyone knows more, please enlighten me. 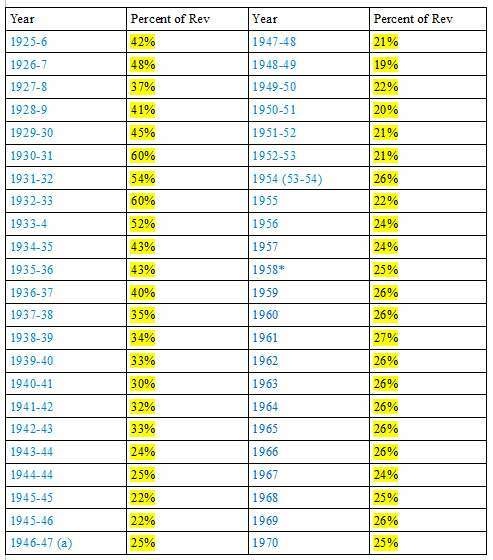 (Although I don’t have access to the 1974 budget, the 1975 one can be viewed here). If funds from Abu Safah were going to the privy purse, the money involved would probably be huge. In 1975, Abu Safah was generating BD 50 million for the Bahrain government, only about BD 10 million less than was being generated by BAPCO. So how much do the ruling family get? In addition to this, the wealth that has accrued to the Al Khalifa family over the years has allowed them to secure lucrative land deals, property investments and monopolies. The legacy of their privilege moves beyond an annual stipend, and one can only imagine the extent of the personal fortunes enjoyed by many members of the family. Thus 25% is probably a conservative estimate. Anyway, my closing thought is simple. Ebrahim Sharif – a man who has continually highlighted this greed and corruption – currently languishes in jail on bogus charges. On the other hand, some people glorify a ruling elite who have been bleeding the country dry for centuries. *Update: When I posted this yesterday I stated that the Al Khalifas had taken a third, and not a quarter of the nation’s wealth. My error was perhaps understandable, as I was calculating percentages from 1959 -1960 using the revenue figure that did not include the extra third missing off the oil receipts. I was therefore using a much lower figure for the revenue than I should have been using. 1) Prior to 1955, the government accounts were produced according to the Hijry calendar. 2) I am not an economist, financier or accountant, but I think the methodology here is fairly sound. I used the same one adopted by Charles Belgrave when he was tallying up what percent of total annual revenue went to the Al Khalifas. After cross checking my results with his, we arrived at the same figures in all cases except for 1345. 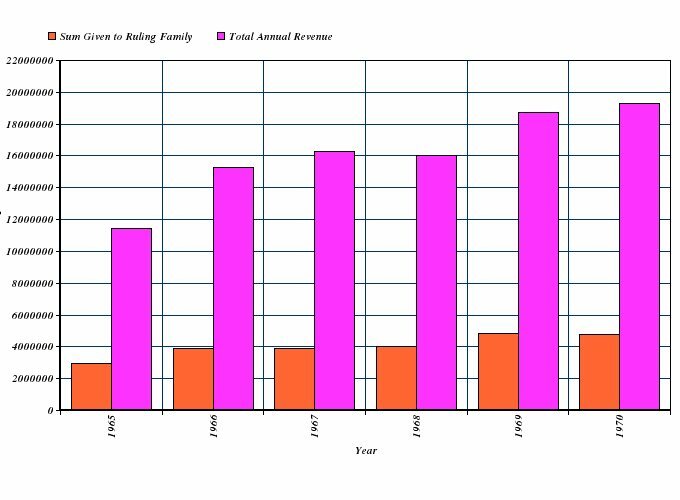 The reason being Belgrave used different figures for the total amount of annual revenue. There were two sets of figures for 1345, and I chose to use the most recent ones. It is also important to note that I used the summary of revenue and expenditure, as opposed to the budget. This gives a more accurate of picture of what was spent and received. 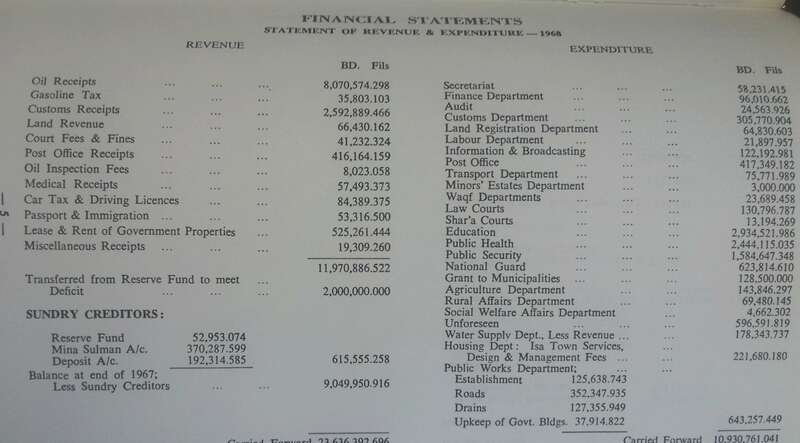 The only exception is 1962, where there was no statement of revenue and expenditure, only a budget.